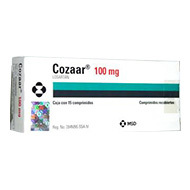 Cozaar is an angiotensin II receptor antagonist drug that is used to treat high blood pressure. Cozaar is used to treat high blood pressure and also slow the progress of kidney disease caused by type 2 diabetes. Take Cozaar exactly as prescribed by your doctor. It can be taken with or without food. It is recommended that you take it at the same time each day. For example, if you take it every morning before or after breakfast or daily with your meals, then you will establish a regular routine and be less likely to forget your dose. However, if you forget and miss a dose then take it as soon as possible. If it is almost time for your next dose, skip the missed dose and go back to your regular schedule. You may store Cozaar at room temperature away from direct exposure to heat, light and moisture. Some of the typical symptoms of an overdose are hypotension (low blood pressure) and abnormally rapid or slow heartbeat. Seek medical attention immediately if you suspect an overdose. Maintain caution if you are taking the drug along with a diuretic. Excessive sweating, dehydration, severe diarrhea, or vomiting could make you lose too much water, causing a severe drop in blood pressure. Contact your doctor immediately if this occurs.